Let your friends and family relax in comfort while enjoying cocktail and snacks on this Bradley Outdoor Patio 4-foot Wood Garden Bench in White with full-back, sounds perfect! Made from 100% Acacia Hardwood that is native to Australia and Asia, and used in the construction to make excellent and high quality furniture that resists mold, mildew, fungi, termites, rot, and decay. Comes in beautiful White Painted Finish, this bench brings your outdoor patio a classic charming look. Bring inimitable Southern charm to your outdoor living area with this classic bench. Perfect for a garden or intimate gathering under the stars, its crafted with antique white acacia wood and finished with silver metal details for unmistakable elegance. This is a great addition to your home whether in the country side or busy city. Nothing is more romantic than an Adirondack loveseat for watching sunsets, sipping cocktails or just enjoying conversation. Adapted from the original 1903 piece designed by Thomas Lee while he was vacationing in the Adirondack Mountains, the Hantom Bench has wide arms and comfy slant back that beckons. Crafted of sustainable acacia wood in white finish with silver galvanized hardware, Hantom is destined to become a backyard favorite. This is a great addition to your home whether in the country side or busy city. Good things come in pairs. The Jovanna Two Seat Bench is the epitome of contemporary style. A sublime fusion of form and function, it offers two full-sized, sturdy seats crafted with acacia wood and galvanized steel connected by a petit table perfect for warm weather cocktails. Bradley Outdoor Patio 4-ft Wood Garden Bench in White Let your friends and family relax in comfort while enjoying cocktail and snacks on this Bradley Outdoor Patio 4-foot Wood Garden Bench in White with full-back, sounds perfect! Made from 100% Acacia Hardwood that is native to Australia and Asia, and used in the construction to make excellent and high quality furniture that resists mold, mildew, fungi, termites, rot, and decay. 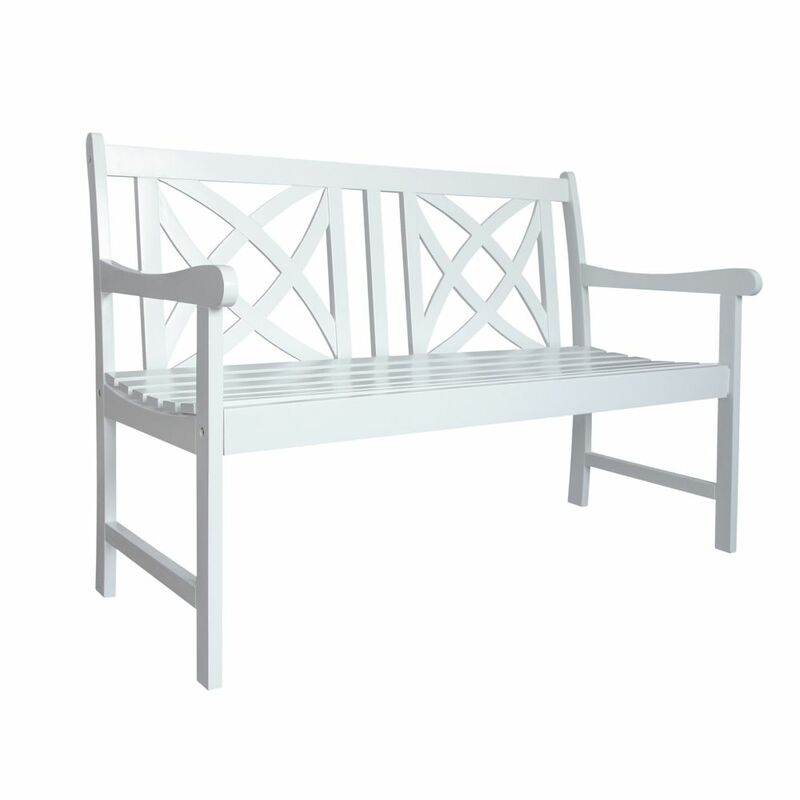 Comes in beautiful White Painted Finish, this bench brings your outdoor patio a classic charming look. Bradley Outdoor Patio 4-ft Wood Garden Bench in White is rated 4.2 out of 5 by 6. Rated 4 out of 5 by Lindsey from The bench adds a simple beauty to my front porch. It arrived soon after ordering, and I was info... The bench adds a simple beauty to my front porch. It arrived soon after ordering, and I was informed of exactly when it would arrive. It was easy to assemble. I wish it had wood covers (don't know the correct term) to put over the screws like my white rocker does which I purchased at my local Home Depot store. Rated 2 out of 5 by Mary from Description said “no assembly required.” That is incorrect. The... Description said “no assembly required.” That is incorrect. The bench comes in pieces. Took half an hour to put two together. Rated 5 out of 5 by Suzanne from This pretty bench looks great on our front porch. ... This pretty bench looks great on our front porch. Shipping was only a few days and ensemble was about 20 minutes for two old folks. Everything you need is in the box.